The rotor on an upwind turbine is in the front of the unit, positioned similar to a propeller driven airplane. This is the most common type of small turbines operating in the U.S. To keep it oriented into the wind, a yaw mechanism such as a tail is needed. Advantage The reduced tower shading. The air will start to bend around the tower before it passes it so there is some loss of power from the interference, just not the degree as in the downwind turbine. Disadvantage The extended nacelle that is required to position the rotor far enough away from the tower to avoid any problems with a blade strike. The blades themselves must be somewhat stiff to avoid bending back into the tower. This will mean the point where the blade attaches to the rotor hub will be stressed during high, gusty wind conditions. 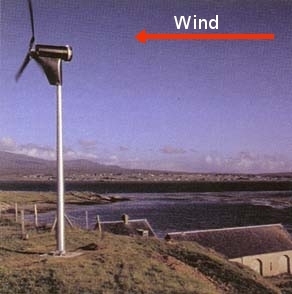 The downwind turbine has its rotor on the back side of the turbine. The nacelle typically is designed to seek the wind, thus negating the need for a separate yaw mechanism. The rotor blades can be flexible since there is no danger of a tower strike. The flexing blade has two advantages. flexing allows some wind load to be transferred directly to the blades instead of the tower. The Proven has a hinged design that allows the blade to flex back to dissipate energy for speed control. The flexible blade advantage can also be a disadvantage as the flexing may fatigue the blades.Tower shadow is problem with a downwind machine since the rotor blade actually passed behind the tower. This can cause turbulence and increased fatigue on the unit. The upwind turbine will be the most common in the small scale, renewable energy scene. The two largest manufacturers of turbines, Bergey and Southwest Wind Power, produce upwind machines. The exception is Southwest Wind Power who recently started selling a downwind model, the Skystream, which is aimed at the grid-tie market. The predominant downwind machine is the Proven brand. Produced in Scotland. For residential size turbines there is no clear winner between the upwind and downwind design. 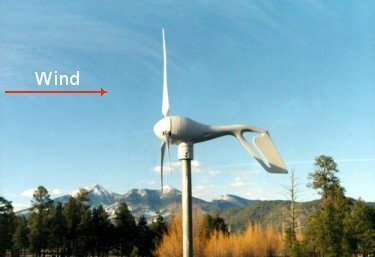 You can't really say that one turbine will last longer or produce more power just because it's an upwind or downwind turbine. Although this is an important factor to consider, it's not the end all be all.